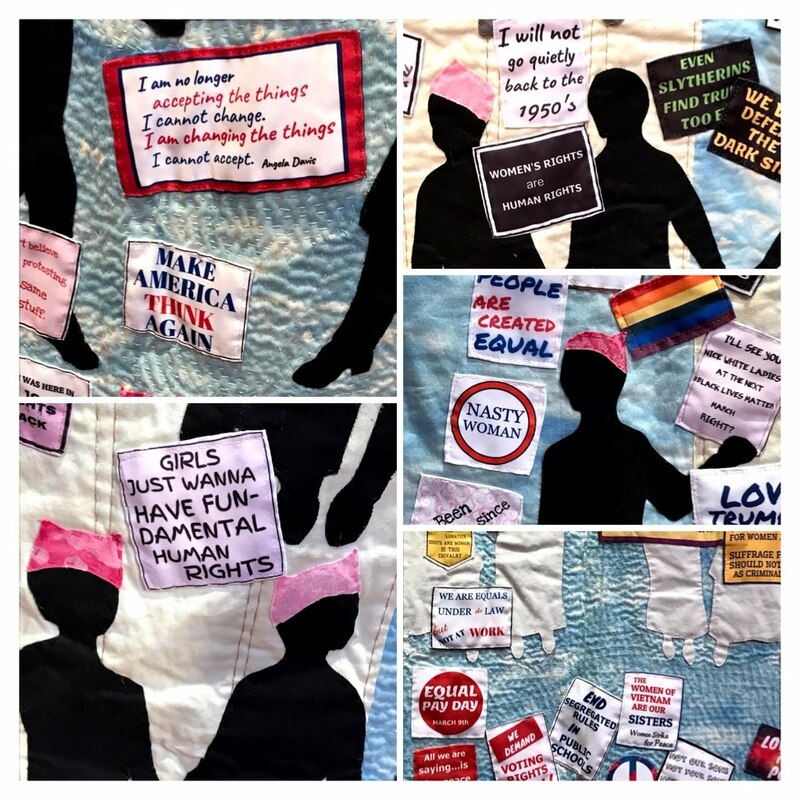 There were some stunning art quilts and some "I could make that!" quilts. On the way home Nancy and I saw a sign pointing to an estate sale in Wadsworth. "Let's go!" we both agreed. We'd never been down that particular street. Nothing on the main level caught our eye, but in the basement we found a vintage Singer (which we didn't need), rolls of upholstery fabric, a couple of chairs in the midst of reupholstery -- and a table piled with fabric. "Fill a bag for $10," said the sign. So I did. The bag held 32 yards and linen tablecloth. The two bright prints are 58" wide. I had the red/tan print years ago and I still like it. Blue homespun and lots of madras plaid. P.S. This is my second favorite from the quilt show. It's woven, not quilted. 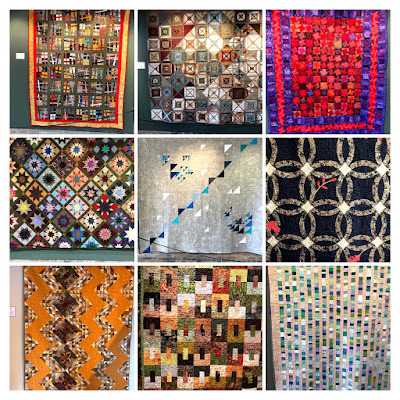 Wow -- there were some beautiful textile pieces at the Fine Art of Fiber show. I agree I like Nevertheless, She Persisted also. I'd have liked to have read all the statements added in. You really got a bounty of fabric! Yea. Bonnie, if you click on the collage photo you should be able to see the sayings better. 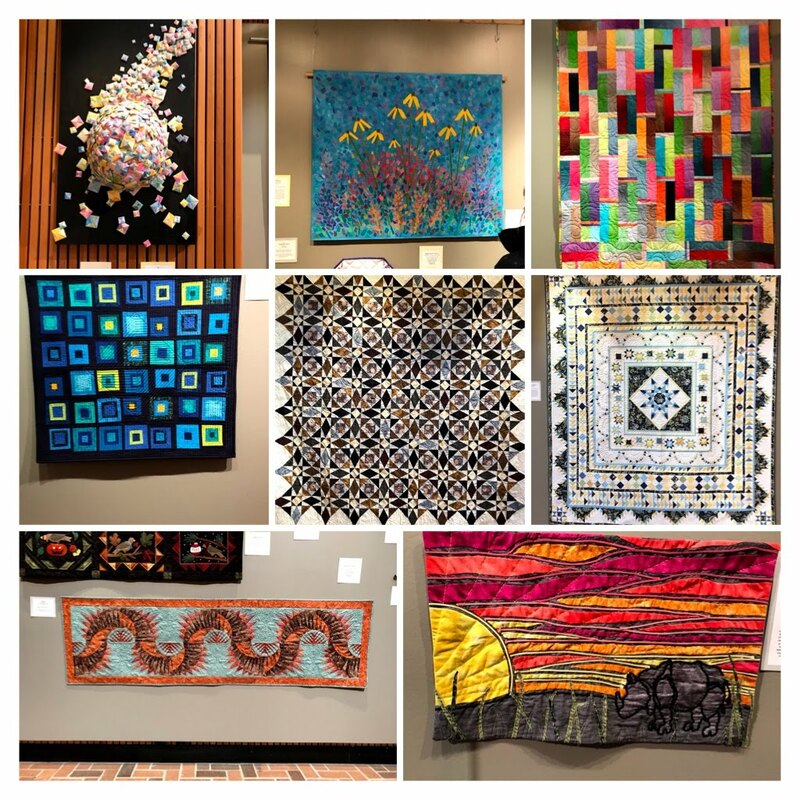 Thanks for the pictures from the quilt show. I can understand why those would have been favorites! You really scores at that estate sale. The upholstery fabric w I’ll make great tote bags. Hi Nann, I’m always glad to hear from you because I can then follow the link back to your blog. I haven’t yet found a way to subscribe to your blog by email, which is how I read blogs. Thanks for the quilt show! 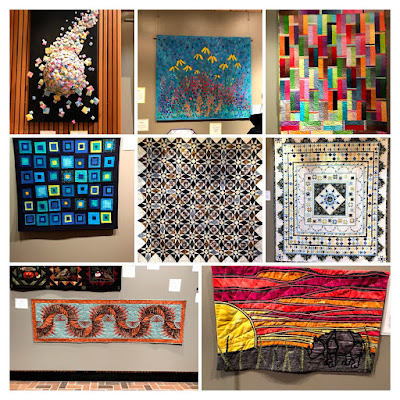 Gorgeous quilts and art pieces. An interesting post, Nann...it looks like you enjoyed your day out. Your scappy squares quilt looks great - I like what you have done with the sashing (comparing last post and this post). 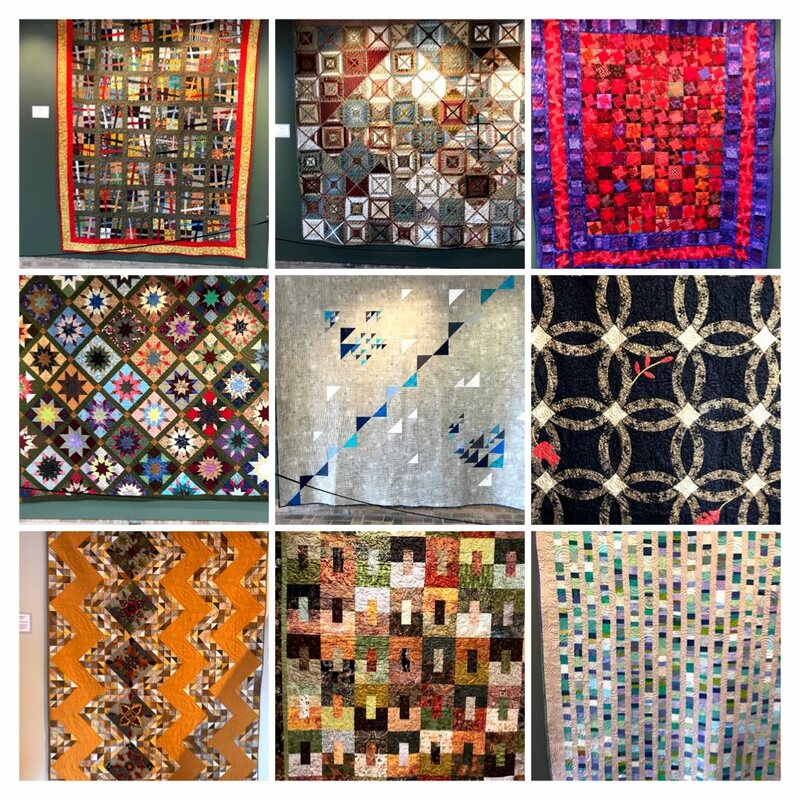 Quilt shows are always a fun day out. You did well with your estate sale shopping. Scrappy Squares turned out beautifully!